This NASA TV frame grab shows a pair of US astronauts as they began a spacewalk outside the International Space to swap and check on two external cooling boxes, nicknamed "Leaky" and "Frosty"
A pair of American astronauts completed a successful spacewalk outside the International Space Station Wednesday to swap and check on two external cooling boxes, nicknamed "Leaky" and "Frosty," NASA said. The boxes, each about the size of a mini-refrigerator or window AC unit, are crucial to keeping the batteries cool aboard the orbiting lab. Since they operate using highly toxic ammonia, the spacewalkers had to take utmost care not to get any on their suits. Known formally as pump flow control subassembly boxes, they were both considered spares, and did not interfere with cooling at the station while the work was under way. "The purpose of the pump flow control subassembly is all about the cooling batteries that the space station holds its electrical power in," explained Anthony Vareha, a flight director at NASA. "We need to keep the batteries cool just like in your cell phone." The outing by veteran spacewalkers Ricky Arnold, 54, and Drew Feustel, 52, lasted six hours and 31 minutes. Their main goal was to move one of the spare pumps, which launched to the space station in 2001 and is called "Frosty" because it once lost power and did not recover it for a few months. "As a result the worry is that that pump got a bit cold and henceforth it was named 'Frosty,'" said Vareha. The astronauts moved "Frosty" to another spot on the station where it could be plugged in to find out if it is indeed a healthy spare or not. They also moved "Leaky," a failed box which was the source of a large overboard ammonia leak about five years ago. NASA said the plan is to leave Leaky on a stowage platform until they decide whether to bring it back to Earth. 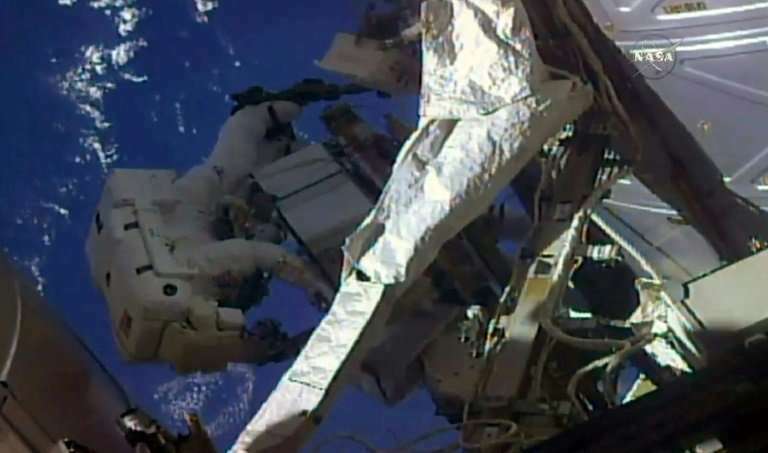 In the meantime, it shall be referred to as "the box formerly known as Leaky," flight controller Alex Apyan said on NASA TV's broadcast of the spacewalk. Another thermal control unit, nicknamed "Motley" because it was assembled from a variety of pieces on Earth, recently flew to the ISS aboard a SpaceX cargo ship and could be installed soon. "All of this swap is to get us best situated so if a pump were to fail in a spot where we really needed it, where it is actually cooling those batteries, we could quickly swap out that pump and keep our cooling going," Vareha said. High-grade ammonia that runs through the cooling loops made the spacewalk somewhat riskier than normal. It is about 10 times more powerful than ammonia in household cleaners, and is highly toxic. "It is something that we are very respectful of because we don't want that coming inside the vessel on the suits at the end of the spacewalks," Vareha said. Astronauts inspected their suits and gloves before re-entering the airlock and found no signs of ammonia flakes. They both, however, could be heard confessing to each other that their hands were tired after a rigorous day of work in the vacuum of space. The spacewalk was the 210th in support of maintenance at the ISS, a space lab the size of a football field that has been circling the Earth for nearly 20 years. It was the eighth spacewalk of Feustel's career and the fourth for Arnold. Another NASA spacewalk is scheduled for June 14. You would think with the vastness of space it would disappear in the emptiness but if they throw it away, it will like a boomerang come back and make a big hole in the ISS.